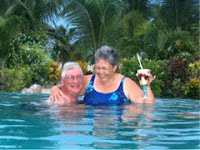 Wendy and I started going down to Belize in 1999 in search of something fun and interesting to do in retirement. Many of my colleagues do volunteer work in the third world and I thought it would be fun as well, just in a beautiful paradise setting, not in a jungle where someone is shooting at you (duh). We went there several times without success in finding volunteer work for either of us, but we had to keep trying, at least twice a year. It was a painful sacrifice on our part, all that sun and Belikin beer, but that is just the kind of people we are. 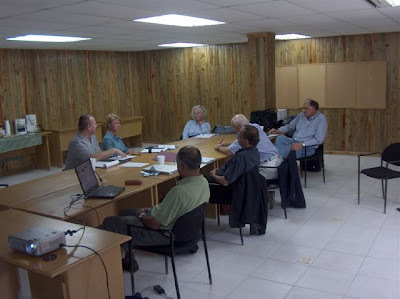 In 2001 we met a young couple from North Dakota who owned a medical school on the island where we go. The government was building a small hospital there, but very slowly. We figured we had our best chance of finding our niche with the medical school as it grew and students became involved in the small hospital when it opened. We visited the school and the Serslands each time we went down, bringing medical journals for the library. Occasionally I gave a lecture to the classes. Then, in 2005, we got our ”break”. They were expanding the school and involving Harvard Medical International. HMI is a foundation run by Harvard Medical School to further medical education in the world. 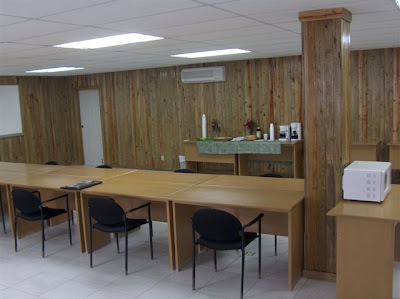 They expressed an interest in the Belize school as the students from there had done well in their training after leaving the school and HMI wanted to see how this was achieved. In order to do this, the school needed money and we invested. Seemed like a good idea at the time. ...........This is a picture of the school. There are 30 "offshore" medical schools catering to mostly American students who can't get into American schools because they are too old or have grades only fair or good instead of excellent. There are only 5 of these schools that even own their own buildings, the rest rent space. It is a fly-by-night business. Our new partner, with 25 years of experience in 4 schools is writing a book on his Caribbean school adventures. He calls it "Pirates of the Caribbean". Anyway, we thought the Harvard thing lent an air of respectability to an otherwise unsavory business. Not really. 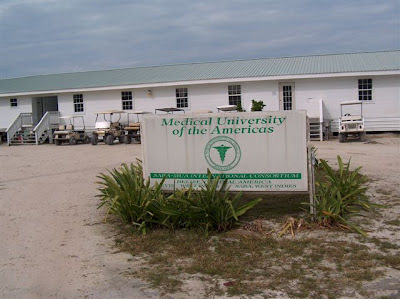 Our school, Medical University of the Americaus Belize, turned out to be just as shady as the rest. 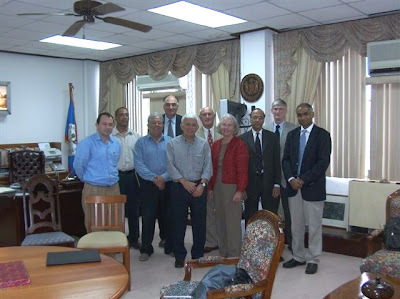 ………… This is in the office of the Prime Minister of Belize . He is the short white-haired guy. Now, this seems very impressive, but remember, more people live in St. Paul than Belize and the only thing more crooked than the typical Caribbean medical school is the typical Caribbean government. Anyway, Dr. Gill has a lot of great experience, a lot of academic integrity, and (like us, before we got started in this) a healthy retirement fund. He has been taking over the reins of running the school from his home and office in Gardiner, Massachusetts , 50 miles out of Boston . The lawyers are drawing up the “closing” papers making this all official (more official than ever before) and we are changing the name to Franklin-Grill College of Medicine. (Gill and his extensive ivy league family of doctors are descendants of Ben Franklin)…………………. SURE SIGNS OF SPRING !! !